Meditations on the Buddhist Path. 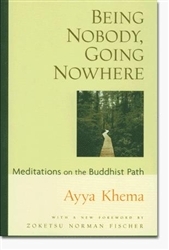 In this new edition of her classic best-selling book, Ayya Khema gives clear, practical instruction on meditation and techniques for overcoming counterproductive mental habits and beliefs. Through the simple practices detailed here, you will develop deeper insight, a sense of calm well-being, and a greater capacity to love and feel loved on a daily basis. Being Nobody also includes an eloquent, sparklingly lucid outline of the Buddhist path that can be understood and enjoyed by everybody.